Although the decision was made in winter we did not do much until May of 2010 on what at the time was called the Bonneville project. 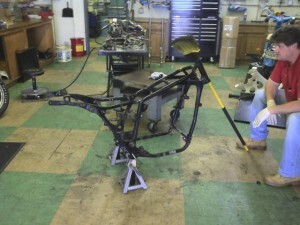 It was called the Bonneville project because we did not even have a motorcycle to use as a starting point yet. 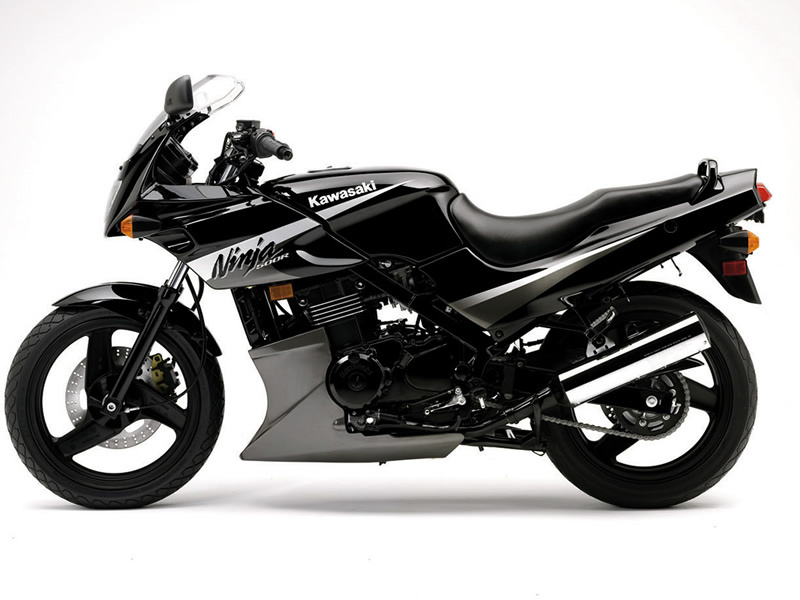 At first we looked at a Kawasaki Ninja 500. Joe on one of his many trips to Delaware came back to the shop with a used 2006 Kawasaki EX500 in the back of the truck. We put it up on the lift and began looking it over to see if this would be our project candidate. Our plan was to run the 500cc Blown with a Turbo charger and we had calculated how much boost we would want to make based on displacement to get the desired horse power we needed to accomplish our land speed record goals. We quickly realized the Kawasaki motor would not hold together for our project. So we parted it out and started to look for another possibility. Our research found that Honda had a V 4 configuration 500 but it was only made in 1984 & 85 The VF500F Interceptor was the next possibility and we found one on craigslist and meet the seller at Boston Chicken and that was our first motor for the project we stripped the bike for all we wanted was a running used 500 cc motor to start with The “Boston Chicken Motor”. 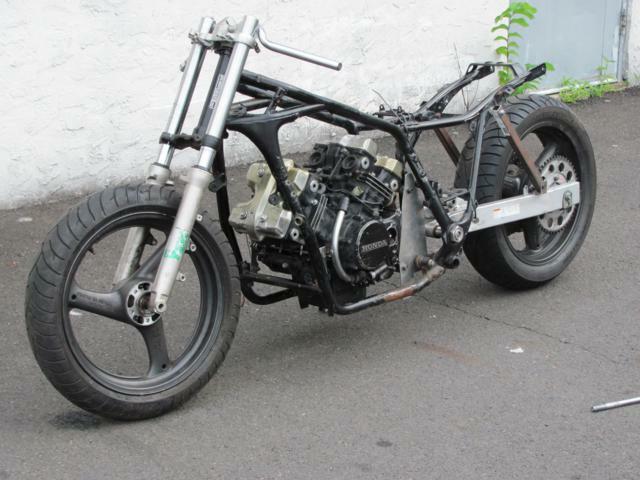 The Interceptor frame had a very short wheel base and was not very friendly for modifying and according to the rule book a Modified Production Bike needs a production Motor and frame from the same manufacturer so we sought out a VF1100 for a frame to use. A few more donor parts from some of the bikes around the shop a swing arm from a 2000 Suzuki Katana and front forks and wheels from a Suzuki Bandit donated by a friend of the shop and Edgar was now a roller. 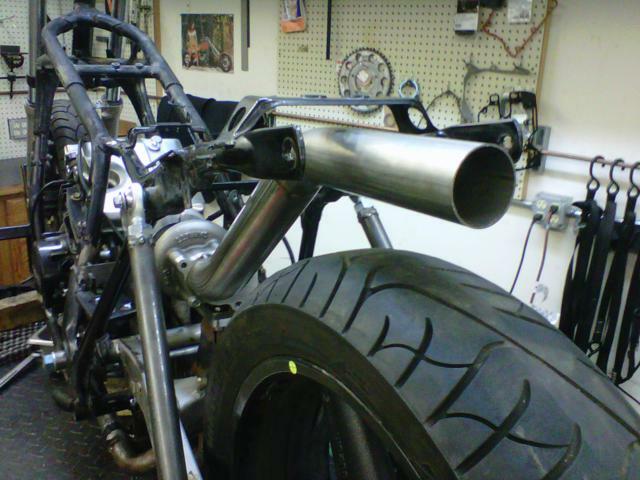 So we mocked up some motor mounts and a 4 ito 1 exhaust into a turbo charger and this was the begining of Edgar. It was this configuration we had when we loaded in a pickup and drove to Maxton NC to the October ECTA Event to get our log book and Sticker for the Bike. at that point Edgar was an official Land Speed Racer but with a long way to go.